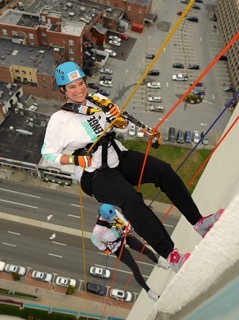 Dianne Covello, Sarah Mead, and Amy Zabetakis joined more than 80 area residents in accepting the challenge to rappel down One Landmark Square in Stamford on October 18, 2014. The event was organized by Shatterproof, a national organization committed to protecting children from addiction to alcohol or other drugs and ending the stigma and suffering of those affected by this disease. Shatterproof hosted 15 Rappelling Challenges in 2014 and is on-track to bring the Shatterproof Challenge to 30 cities in 2015. Continuing Rucci Law Group’s long commitment to local public service, the firm supports Shatterproof’s mission to end the stigma and secrecy associatedÂ with addiction and to fight for a cure. Amy Zabetakis commented, We all know someone that has been impacted by the disease of addiction but we may not realize how wide spread the issue is because no one ever talks about it. I can think of no better way to show my support than by overcoming my own fear of jumping off of a very tall (even taller when you are up there!) building. The experience was both terrifying and exhilarating. The Shatterproof Challenge will return to Stamford on July 16, 2015, and Rucci Law Group will once again field a team. Amy Zabetakis admitted, While I can’t honestly say I am looking forward to doing it again, I have promised myself that I will because this is an important cause that needs to be discussed and fought in the open or, in this case from the top of a building. 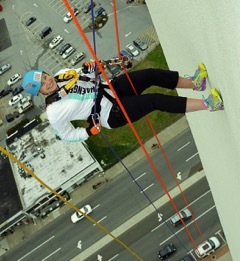 For more details on Shatterproof and the Rappelling Challenge please visit the organization website at http://www.shatterproof.org.